San Isidoro de León, on the French Way to Santiago de Compostela, is one of those very special monuments to visit and an amazing place to stay. Located in the historic centre of the city of León, San Isidoro is an impressive XI century Romanic complex that includes a church, royal pantheon resting place of kings, a convent, library and museum. In the year 1063, King Fernando and Queen Sancha ordered the consecration of Saint Isidoro Basilica, next to the Royal Pantheon and they ordered the remains of Saint Isidoro to be brought to León from Seville. Since 2005, San Isidoro has also been open to the public as a restaurant and a very unique hotel. 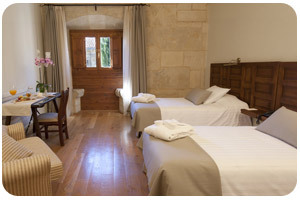 The hotel only has 30 rooms and incorporates modern comforts, in a simple and practical fashion, blending in beautifully with the amazing history, art and architecture of the original buildings. 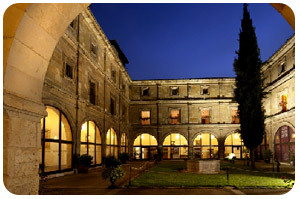 San Isidoro de León is an unforgettable stay on the Camino de Santiago. The hotel calls itself ‘Casa de Espiritualidad’, spirituality home; and guests will certainly find a peaceful and restful space inside the doors of this amazing building complex. Stroll along the monument’s cloisters, admire the paintings, visit the vault, explore the museum and once you take in all the history and beauty, don’t forget to taste León’s traditional dishes and regional cuisine at the restaurant.